Lovely, charming picture, which heralds spring. Love faded, delicate colors and excellent quote. The character brings more has this superb photograph, well with you. Love this shot – the combination of the clouds and the figure is great. As the famous American chief Emeril Lagasse would say…BAM! The reclining figure is the spice that makes this “recipe” come alive. Wonderful composition that goes beyond an image to tell a story. Oh this looks so relaxing. Love the tint! Wonderfully relaxing! I love it! I love your subtle color treatment and framing. It make sme wonder what is she thinking It also makes me want to do just that – go back on vacation and lay in the grass! really quiet and relax shot ..
Un joli travail sur les nuages. Une magnifique. So calm and peaceful atmosphere in this one! Self portrait is it? 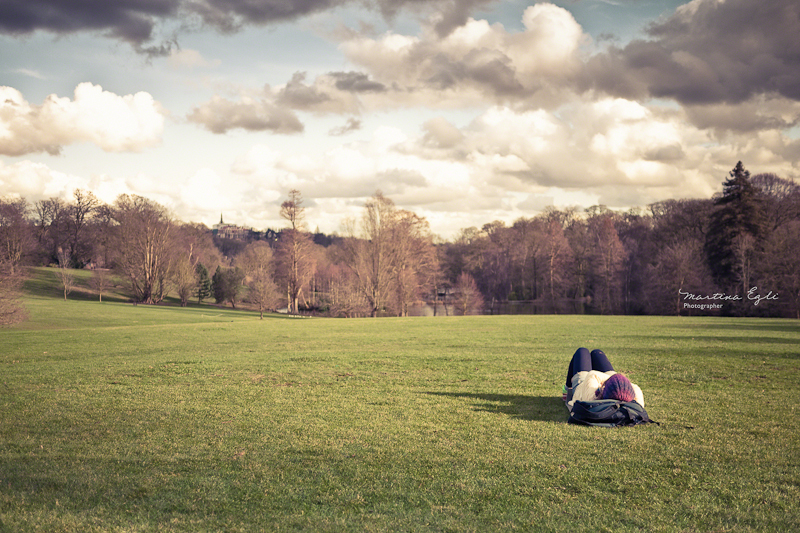 I think the bit empty lawn to the left of the girl really enhances the feeling of a quiet time-out on earth even though the sky is busy. Makes a nice kontrast. Nice place to relax. I love the depth of this picture. Wonderful feel to this photo. Love it!